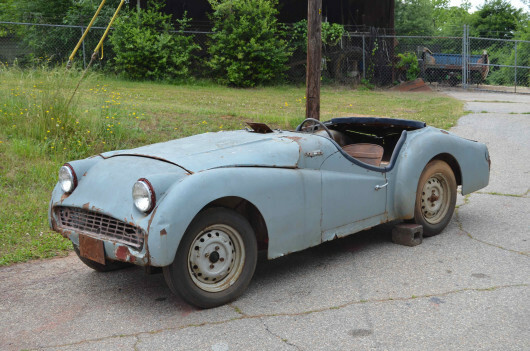 Up for auction is a 1958 Triumph TR3A rolling chassis. 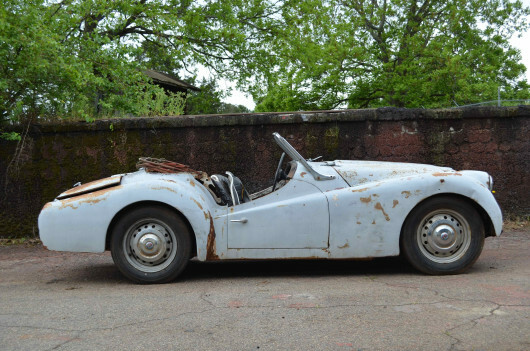 This car is perfect for someone with a rusty TR3 that they wish to restore. The frame is in good solid shape and the body has many usable pieces. Both doors are solid, open and close well and retain all the latch hardware. All four wheels roll; the brake, steering and suspension systems are all intact. The original banjo steering wheel with ignition timing horn button is included. The door panels, dashboard and sill leather are in remarkably good condition. Also included is the grille, headlights, both horns, fuse panel and seat frames. Mileage is unknown. See our eBay store (http://r.ebay.com/lgP8sc) for auctions of additional TR3 parts plus this car’s sister, a complete 1958 TR3A.